At the equator, the Sun provides approximately 1000 watts per square meter on Earth's surface. The top diagram shows how the strength of sunlight is less nearer the Earth's poles. 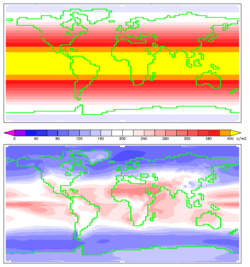 The lower map shows how much solar energy hits the Earth's surface after clouds and dust have reflected and absorbed some solar energy. To take the salt away from sea water. To use sun rays for drying clothes and towels. After passing through the Earth's atmosphere, most of the Sun's energy is in the form of visible light and infrared light radiation. Plants convert the energy in sunlight into chemical energy (sugars and starches) through the process of photosynthesis. Humans regularly use this store of energy in various ways, as when they burn wood or fossil fuels, or when simply eating plants, fish and animals. Solar radiation reaches the Earth's upper Earth's atmosphere with the power of 1366 watts per square meter (W/m2). Since the Earth is round, the surface nearer its poles is angled away from the Sun and receives much less solar energy than the surface nearer the equator. 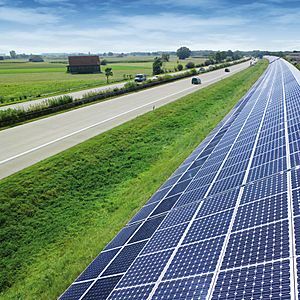 At present, solar cell panels convert, at best, about 15% of sunlight hitting them into electricity. The dark disks in the third diagram on the right are imaginary examples of the amount of land that, if covered with 8% efficient solar panels, would produce slightly more energy in the form of electricity than the world needed in 2003. Solar energy absorbing panels on the sound barrier next to the Munich airport. 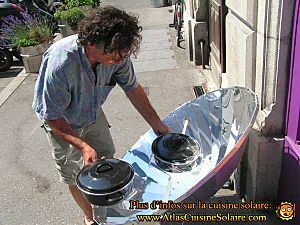 Many technologies have been developed to make use of solar radiation. 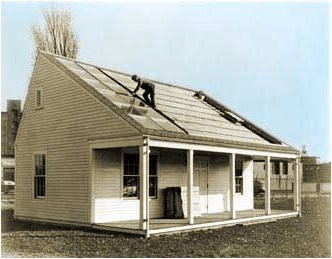 Some of these technologies make direct use of the solar energy (e.g. to provide light, heat, etc. ), while others produce electricity. Solar power plants convert sunlight into electricity, either directly using photovoltaics (PV), or indirectly using concentrated solar power (CSP). Concentrated solar power systems use lenses or mirrors and tracking systems to focus a large area of sunlight into a small beam. Photovoltaics converts light into electric current using the photoelectric effect. Topaz Solar Farm USA &&&&&&&&&&&&0500.&&&&&0500 installed capacity as of June 2014. California Valley Solar Ranch USA &&&&&&&&&&&&0292.&&&&&0292 399 First 130MW connected Feb 2013. View of Ivanpah Solar Electric Generating System from Yates Well Road, San Bernardino County, California. The Clark Mountain Range can be seen in the distance. House with solar panels for heating and other needs in Jablunkov, Czech Republic. Liquid-based systems heat water or an antifreeze solution in a "hydronic" collector, whereas air-based systems heat air in an "air collector." Both air and liquid systems can supplement forced air systems. Photo of 4 inch by 4 inch cell. Solar cells can be used to generate electricity from sunlight. It is a device that converts light energy into electrical energy. Sometimes the term solar cell is reserved for devices intended specifically to capture energy from sunlight, while the term photovoltaic cell is used when the light source is unspecified. 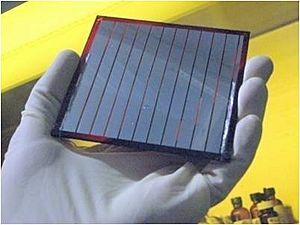 Solar cells have many applications. They have long been used in situations where electrical power from the grid is unavailable, such as in remote area power systems, Earth-orbiting satellites and space probes, consumer systems, e.g. handheld calculators or wrist watches, remote radiotelephones and water pumping applications. Darmstadt University of Technology, Germany, won the 2007 Solar Decathlon in Washington, D.C. with this passive house designed for humid and hot subtropical climate. Concentrated solar panels are getting a power boost. Pacific Northwest National Laboratory (PNNL) will be testing a new concentrated solar power system -- one that can help natural gas power plants reduce their fuel usage by up to 20 percent. Solar energy Facts for Kids. Kiddle Encyclopedia.